This won’t be a game for the colourblind. 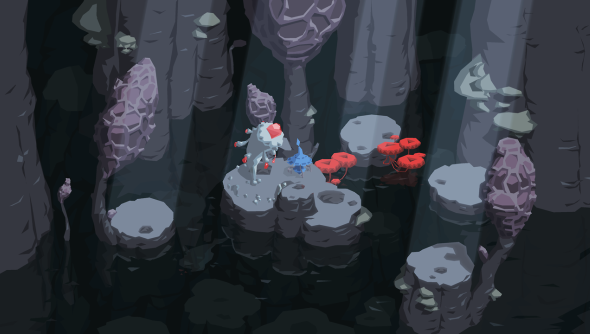 Perlinoid’s a game about blending and separating colours to advance through alien environments. We’ve only a short video of in-game footage to work from but in 30 seconds we get a pretty good idea of the puzzles and scope this mechanic has. Watch it and prepare to have your brain scratched. 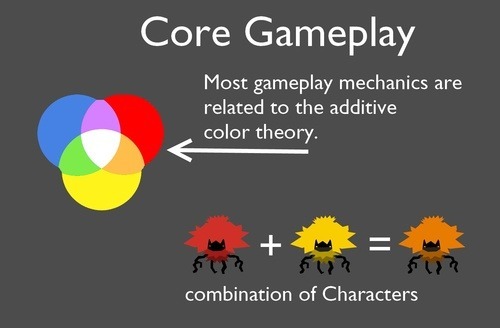 You control a gaggle of coloured critters, only red and blue are on show in the video but yellow would be a natural extension (it’s the third major colour highlighted by the developer in this chart). The creatures can join together, blending their colours. Red and blue and join together to make purple, for instance. Or yellow and red to form orange. It’s these hybrids that are central to the puzzles of Perlinoid. The fauna of this alien world respond to the colour of the critter that tries to cross them – blue platforms will only let blue (or blue-ish) aliens to pass. When your red alien tries to pass they shrink away, preventing it from crossing the chasm. However, ff you blend the two together, though, making purple, the plants no longer cower. It’s a simple puzzle and what you can imagine will appear in an early tutorial level. Later the levels will no doubt become more complex. There’s a lot for a developer to work with. What if, for example, there are things in the world that change the creatures shade – streams of coloured water that your critters can’t pass without becoming painted. It’s still very early days of Perlinoid – the game’s tumblr page only has two brief entries – but I really want to see where its developer takes it.